I’ve been working on a near complete re-write of Tracks2Miles over the last couple of weekends months. It’s taken so long for a couple of reasons, when the weather was good I just wanted to be outside running/cycling and for the (larger) period when it was grim out just not wanting to spend any more time writing code after doing it all day at work. I know that a tablet layout for Tracks2Miles may seam a little strange since it started out as just a way to upload routes recorded by My Tracks and the image of a guy out jogging with a 10.1″ Galaxy tab strapped to their arm is a little stupid. But since adding the ability to view the timeline of workouts and to manually enter workouts it has started to make some more sense. That and the stats* says there are at least 31 tablet (running Android 3.1/3.2, there may be more on 4.x+) users already out there. Hopefully this new layout will pull in some more tablet users as (IMHO) looks a lot better than the phone view scaled up. 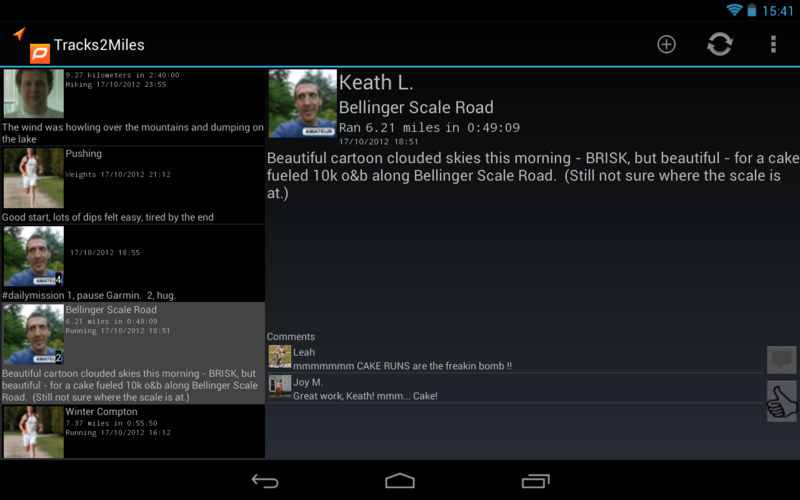 The other big change is the move to using the built in sync mechanism to drive the collection of new timeline entries. This means you can now have Tracks2Miles pull in new workouts, comments and routes on a regular basis in the background. A side effect of this is that I’m going to have to drop support for Andriod 2.1 as the syncing API had some improvements that make this a lot easier at 2.2. The same stats that showed the total number tablet users show there are only 39 users left on 2.1. The older releases should continue to work for them. This use of the syncing API means that I the timeline can be updated at regular intervals in the background so you will always have the latest workouts when you open the all and allows me to add alerts for when there are new entries. A feature requested by Brian O’Donovan was the ability to sanity check speeds for different workout types, I think this mainly came about because of the distance conversion feature when the units are changed. I’ve added some options to the beta settings menu that allows you to set a min and max speed for a few of the workout types. 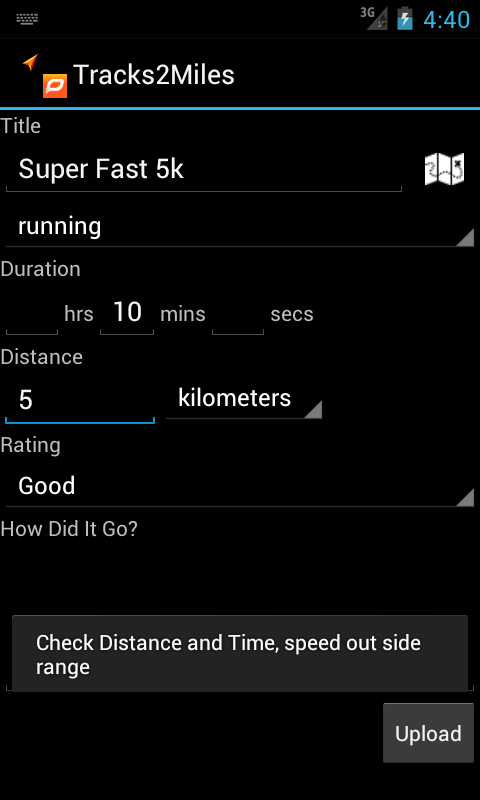 If you enable this checking a toast message will pop up if the average speed for a workout is outside these ranges. You can access the limits under the beta section of the preferences screen. At this point I think I’ve pretty much exhausted the capabilities of the current Dailymile API but hopefully there should be a improved version due soon. In the mean time I suppose the next step would be to look at translating Tracks2Miles to some other languages. The Google Play stats suggest that Germany might be a good first choice. I cut what I hope to be the final beta today and after hearing back from the testers I’ll push it to Google Play as an update. * Up until v2.0 I’ve been using the built in stats that come with the Google Play, but for this release going forward I have also included the Google Analytics library so I should get a much clearer picture of what the spread of devices running the app are. Now I’m back from my amazing holiday in Yellowstone it’s time to put in a final push to get Tracks2Miles V2 out the door. I have all the core functionality working now and I just need to finish off some of the new value add features.